Neil's parents lived in Bastrop from 1916 to 1922 and then moved to Laredo, Texas, where he was born. The family returned to Bastrop in 1943. He graduated from Bastrop High School in 1946 as Valedictorian. He attended Texas A&M University and graduated from Southern College of Optometry in Memphis, Tennessee. He recently celebrated his 50th year in optometric practice. Neil and his wife Betty have three grown children: Anita Feigenbaum and spouse Leslie of College Station, Karen Kahan and spouse David of Bastrop, and Elliott Gurwitz and spouse Emily of San Antonio. All three children are graduates of Bastrop High School and the University of Texas at Austin. The pride and delight of the grandparents are Sarah and Ryan Feigenbaum, Philip and Steven Kahan, and Ethan and Zoe Gurwitz. 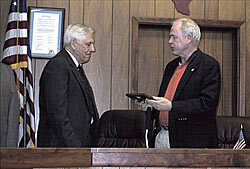 Gurwitz (on left) receives plaque from Bastrop Mayor Tom Scott April 2001 for his "dedication and service" to the community of Bastrop. 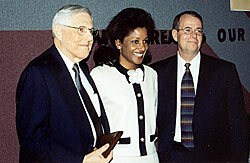 Gurwitz (on left) named Bastrop "Citizen of the Year" for 2000 pictured with "Woman of the Year," Dr. Desmar Walkes, and "Man of the Year," Police Chief Bill Anderson. 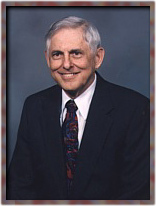 Neil served on the Bastrop Independent School District Board 7½ years from 1965-1972, and served 4 years as president. He served on the Bastrop Library Board for about 12 years, and served on the Bastrop City Council from 1987 to 2001. He did not seek reelection in May 2001 and was recently honored by the Council with a reception for his 13 years of service to the city. He was named Bastrop Citizen of the Year for the year 2000 by the Bastrop Chamber of Commerce. He has been a member of the Bastrop Chamber of Commerce and the Bastrop Noon Lions Club for almost 50 years. He has also served on the Bastrop Economic Development Corporation Board since it was started. This site was originally established to allow voters to meet the candidate for the May 1, 1999 Bastrop, Texas City Council Election. Due to the positive interest and comments that we received about this Web site, we decided to continue to offer additional information and updates on the progress and challenges facing the city, as well as other city information. This site is not an official Web site of the City of Bastrop, Texas. I always invite your comments, questions, and suggestions!